classic movies | ___is black the new black? I adore Netflix. I really do, but my queue is a million miles long. I’ll be bored one night and I start looking at my friends’ queues or whatever and I add a bunch of stuff. Sometimes I remember why. Many times I don’t. This is a bad bad thing and it’s called Netflix Amnesia. Here is my cautionary tale. Reap the Wild Wind came in the mail this weekend. I don’t remember adding this to my queue, but it’s there and in my hands and I really want to veg out in front of the TV. The blurb on the dvd sleeve is not promising. It’s a Cecil B. DeMille picture with John Wayne, Paulette Goddard, Susan Hayward, and Ray Milland . John Wayne is hit or miss for me. I really don’t care for Paulette Goddard, and while I like Susan Hayward and Ray Milland, I can’t see myself adding this film for them either. I should mention that I really have an intense dislike for the films of the late Mr. DeMille. The credits are rolling and I feel a little bit better. Raymond Massey is in it and also Charles Bickford. Okay. This is why it’s there. 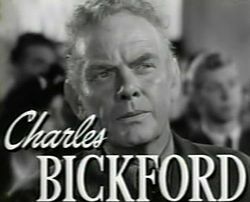 I love Charles Bickford, absolutely love him. This makes some sense. I have yet to see a bad performance of his. He was started out as a leading man, but had some injuries and ended up doing character and supporting work. He was superb in Days of Wine and Roses as Lee Remick’s father. After about five minutes, I’m really doubtful about this movie. Seriously 5 minutes. I hit pause and go check it out on IMDB. User reviews are all pretty much positive. I decide to give it some more time. In retrospect it occurs to me that the reviewers were all clearly high when they posted those. Okay, so here’s the plot. It’s the 1840s in the Florida keys and ships keep getting cracked up on the reefs. There are a bunch of salvage operations. Paulette Goddard’s family owns one. Miss Goddard evidently saw this as her chance to play Scarlett O’Hara (and omg, are we lucky she missed out on that part). So we have a poor man’s Scarlett O’Hara in Florida. Raymond Massey and his brother Robert Preston also run a salvage operation, but they are bad, bad men. Evidently what they do is actually wreck the ships rather than wait for it to happen accidentally. Susan Hayward is Paulette’s girly cousin who’s sneaking out on the sly to make out with Preston. Enter John Wayne as a sea captain. Paulette and he hook up and she’s all about him. Wayne wants to be the captain of a steam operated ship more than anything. So Paulette goes off to Charleston to stay with her Aunt Hedda Hopper (yes, she acted too). She starts making time with the foppish Ray Milland who works at the same shipping company; he also has some pull with which captain gets assigned to which ship. Milland’s character has a lap dog and he does really bad ventrioloquism act with it. The guy who owns the shipping company is understandably annoyed that none of his ships are making it to port. He sends Milland and the lap dog off to the Keys to put a stop to Raymond Massey and his crew. There’s also some stuff about the triangle between Goddard, Milland, and Wayne. It gets worse from there and way more plot intensive. John Wayne strays down the primrose path to hell. Susan Hayward picks the wrong ship to go see Robert Preston on. Paulette Goddard overacts wildly. By this point, I’m invested in seeing if it can get any worse. Charles Bickford does show up and is very good for his 7 minutes of screen time. And then it happens. There is a giant squid. Yes, that’s right a giant squid. 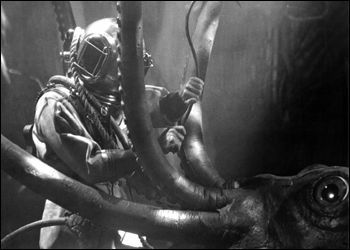 Ray Milland and John Wayne must dive down to the wreck to see if they can find Susan Hayward’s body so that Raymond Massey can pay for his crimes. Paulette Goddard’s heart (and body) are kind of on the line too. So they go down there and there it is. A giant squid. A giant squid. Stunned disbelief takes over at this point. I can’t look away. I mean, how can you? Will John Wayne let Ray Milland be eaten by the giant squid so he can get Paulette Goddard to himself? Will he redeem his damaged character by saving Ray Milland? And it’s a giant squid. John Wayne battles giant squid. Bad bad thing. Netflix amnesia should be avoided. Don’t let this happen to you. TCM was airing a pre-code gem the other night: Baby Face. Barbara Stanwyck plays Lilly, the girl from the wrong side of the tracks who will do anything to get on the right side of the tracks. In true, pre-code fashion, it is made explicitly clear that she sleeps her way to the top of an office building–literally. It’s a hoot to watch. George Brent plays the male protagonist and is well, George Brent. Early George Brent. I think he became more memorable as he aged and started playing more character roles. Here he’s totally outmatched by Stanwyck. One thing I really love about this film is how very unrepentant Lilly is. She doesn’t give two hoots about any of the men she uses or what befalls her. She is loyal to her friend (played ably by in Theresa Harris). There’s a tacked-on ending that reportedly was added to shut up the Hayes Office (the Production Code given teeth by then and 1934 was the start of the new regime’s reign of terror er…power), but it doesn’t negate the rest of the film’s impact. I hit the wrong channel button on my remote last night and tumbled onto the most haunting, emotionally wrenching film I have ever seen in my life. Grave of the Fireflies is from Studio Ghibli, the same studio that made Spirited Away (another amazing film). It’s directed by Isao Takahata who I just realized was the director on Only Yesterday, which I also loved. Grave of the Fireflies is set in Japan during World War II. It’s about the increasingly doomed attempts of 14-year-old Seita and his little 4-year-old sister Setsuko to survive. It’s also about how a surfeit of pride and what the horrors of war can do to civilians.